Hip prosthesis or Hip implants is a treatment of replacing the hip joint with an artificial tool, this might be due to some injury or for that matter a disease. A spoon shaped plate; hip screws, bolts and other such instruments are used and fixed into the damaged areas reconstructing the hip area. Bipolar prosthesis is used for the treatment of hemiarthroplasties that sees one half of the hip joint being replaced while the other half remaining intact as it is. Hip implants are a common procedure today with a number of people with hip problems opting for it. The new age devices make it more harmless and recuperation is complete giving absolute comfort to the joint and a renewed vigor and strength on recovery. Even people suffering from arthritis may as well benefit from Hip prosthesis. Hip resurfacing is a substitute for Hip prosthesis for it merely places a metal cap on top of the femoral head instead of severing it as with the more complicated procedure of Hip prosthesis. Austin Moore Prosthesis, Thompson Prosthesis, Bipolar Prosthesis, etc. are the various Hip Fixation System used by surgeons around the world. These hip implants devices come in different sizes and used according to the requirements of a patient and which size fits perfect. Other Hip fixation instruments used in hip implants are a head extractor and impactor with Nylon Face, Rasp with Tommy Bar, Set of Gauge etc. Made of the finest materials, the tools of Hip prosthesis are branded and have passed various certified test for checking the quality of a good like CE certifications, FDA certifications etc. Only manufacturer like us 'Orthopedic- Implants.Net' can pass and get all these certifications and is also an able exporter to foreign countries. Apart from Hip prosthesis there are joint fixation like external fixator, clamps, plates, bone implants, etc are manufactured, supplies and exports by us. In short quality Hip prosthesis are provided at reasonable rates by Orthopedic-Implants.net a division of D4 Surgical India Pvt. Ltd. The leading manufacturer and exporter has the ability to keep on churning more and more of these equipments to meet the ever increasing national and international demands. We are Hip Implants / Fixation systems manufacturer, supplier and exporter from India. We provide quality hip prosthesis of various types like Austin Moore hip prosthesis, Thompson hip prosthesis, Bipolar Hip Prosthesis, etc at reasonable cost. 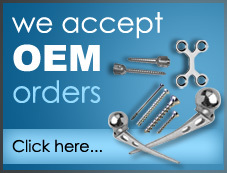 We also export orthopedic joint implants, hip fixators, devices and instruments set across the world.